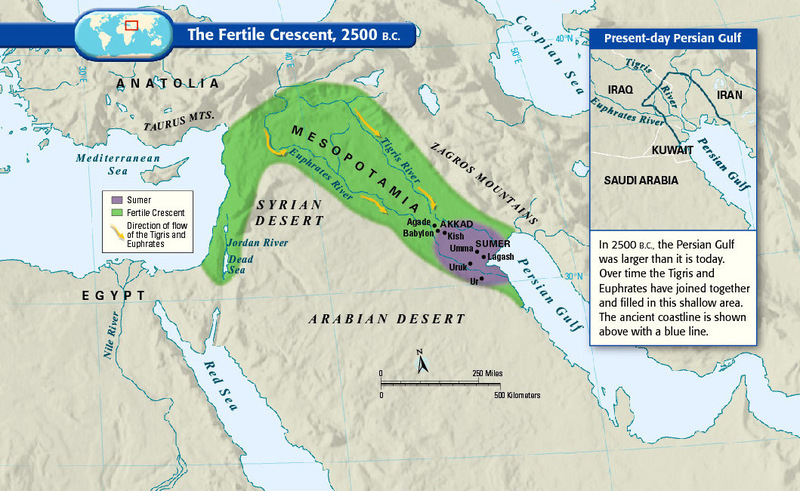 Often called the birthplace of human civilization, the “the fertile crescent” because of its lush soil, the “crescent” of land mostly includes modern-day Iraq, Syria, Jordan, and Israel-Palestine. (Some definitions also include the Nile River valley in Egypt.) People started farming here in 9000 BC, and by around 2500 BC the Sumerians formed the first complex society that resembles what we’d now call a “country,” complete with written laws and a political system. This entry was posted in Links, map making and tagged map, middle-east. Bookmark the permalink.